Hungary’s prime minister says it’s a “gloomy Sunday” because of the Brexit agreement between Britain and the European Union. Orban said the EU leadership bore responsibility for Brexit, adding that if Britain, a rich country, had remained in the EU, Hungary would have received more EU funds in the future. Orban also said that had the countries in Western Europe not allowed migrants in, the British would have stayed in the EU. “Gloomy Sunday” (originally “Szomoru vasarnap”) is a 1930s Hungarian song written by Rezso Seress. “That seems to me to be an absolute negation of taking control, that would put us in a worse position than we are now,” he told BBC Radio. Howard was party leader when the Conservatives were defeated by Tony Blair and Labour in 2005. He serves in the House of Lords. Romania’s president has welcomed the Brexit agreement saying it will protect the rights of hundreds of thousands of Romanians in Britain. He welcomed the fact that Romanians wouldn’t need visas to travel to Britain after it leaves the bloc. Romanian officials estimate about 500,000 Romanians live in Britain, although just 190,000 are officially registered there. The leader of Britain’s main opposition party says that it will vote against the Brexit deal when it comes before Parliament. He said that Labour’s goal is to vote this deal down in Parliament and then “work with others to block a no-deal outcome” that many believe would badly damage Britain’s economy. The party would instead fight for a “sensible deal” that would include a permanent customs union, a single market deal and guarantees on workers’ rights and other issues. Labour’s opposition to May’s proposal will make it harder for her to win majority support in Parliament. French President Emmanuel Macron has said the European Union must “learn lessons” from Britain’s decision to leave it. Macron also paid homage to British Prime Minister Theresa May for seeking a “path to durable cooperation” with the EU, while defending UK interests during negotiations. Twenty-seven EU leaders endorsed a deal Sunday that sets out the terms of Britain’s departure on March 29 and sets a framework for future ties. British Prime Minister Theresa May says she is not sad about leaving the European Union even though she recognizes some Britons and some European leaders feel that way. 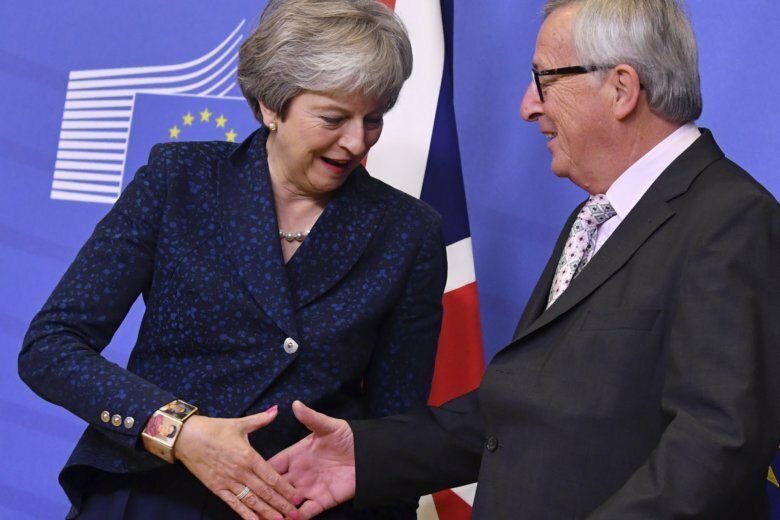 May said Sunday she is “full of optimism” about Britain’s future outside the EU bloc, after leaders finally signed off on a Brexit deal in Brussels after months of negotiations. “The way I look at it, actually, this is for us now to move on,” she told a press conference, asserting Britain had reached a “good deal” with many benefits for Britain and its people. She spoke after German Chancellor Angela Merkel and other European leaders expressed sadness about Britain’s planned departure. May said Britain will continue to have warm, friendly relations with European countries after it leaves the EU bloc. Varadkar said he believes British Prime Minister Theresa May’s chances of getting the agreement through parliament are strong. British Prime Minister Theresa May said the Brexit deal that European Union leaders signed off on Sunday was the best and “only possible deal” for the British parliament to vote on, warning lawmakers there would be no option to renegotiate anything. May told reporters after a Sunday morning summit she agreed with EU leaders saying that there would be no other options on the table before Britain leaves the bloc on March 29. “If people think somehow there is another negotiation to be done, that is not the case,” she said. British Prime Minister Theresa May says the U.K. Parliament will vote on the divorce deal with the European Union before Christmas. May says Sunday’s signing-off on the agreement by the EU marks the end of one phase and the start of a “crucial national debate” on Britain’s future. May says she will fight “heart and soul” to get backing for the deal, which faces huge opposition among her Conservative lawmakers as well as the opposition. The Spanish prime minister says that Spain’s position on the disputed British overseas territory of Gibraltar has emerged stronger in the Brexit deal signed off Sunday by European Union leaders. Spain claims Gibraltar even though it was ceded to Britain in 1713. The country was the last to agree to the Brexit deal, saying it would only back it on condition of a guarantee of Madrid’s say in the future territory at its southern tip. At the end of a largely ceremonial summit to rubber-stamp the U.K. withdrawal agreement from the bloc and a draft text on the future relations, Jean-Claude Juncker made it clear the British House of Commons should not count on starting a renegotiation. “It would not be a good idea to lecture the House,” Juncker said, but insisted that it was only deal possible. The deal must still be endorsed by the British parliament and EU parliament. Opposition parties and many in May’s own Conservative Party have opposed the agreement. The leader of the Democratic Unionist Party in Northern Ireland says there are no circumstances under which her party would support the current Brexit deal. Arlene Foster said minutes after the deal was endorsed by European Union leaders in Brussels on Sunday that her party is firmly opposed to its provisions because it would separate Northern Ireland from the United Kingdom. She stopped short of saying her party would end its support of Prime Minister Theresa May’s Conservative Party, a key point because the DUP supplies the votes needed to prop up May’s minority government. Foster is calling for more talks to come up with a better plan. “I believe we should use the time now to look for a third way, a different way, a better way,” she told the BBC. European Parliament President Antonio Tajani has used the EU Brexit summit to highlight a separate issue — violence against women. Tajani sported a red swipe under his left eye as he addressed a press conference at the EU summit. In Italy, the mark stands for support of the UN’s International Day for the Elimination of Violence against Women. European Council President Donald Tusk says the European Union has approved a Brexit deal with Britain. The deal sets out the terms of Britain’s departure on March 29 and sets a framework for future ties. Now British Prime Minister Theresa May faces the tough task of selling the deal to a skeptical U.K. Parliament. European Commission President Jean-Claude Juncker says it’s a tragedy that Britain is leaving the European Union but that the country is walking away with the best deal it could hope for. Juncker said that “it’s a sad day,” as he arrived Sunday for an EU summit in Brussels to endorse the Brexit agreement. She says several things could happen in that case, including a new referendum on Brexit, new elections in the U.K., or a request to renegotiate the deal with the EU. Britain leaves on March 29, but future relations and trade will be tackled during a transition period lasting at least until the end of 2020. European Union leaders are gathering to seal an agreement on Britain’s departure from the bloc next year, the first time a member country will have left the 28-nation bloc. At a summit in Brussels Sunday, the leaders are due to endorse a withdrawal agreement, which would settle Britain’s divorce bill, protect the rights of citizens hit by Brexit and keep the Irish border open. They will also rubber stamp a 26-page document laying out their hopes for future relations after Britain leaves at midnight on March 29. The last big obstacle to a deal was overcome on Saturday, when Spain lifted its objections over Gibraltar. The deal must still be endorsed by the British parliament and EU parliament.